In an upset of all upsets, Jungle Heat’s Madness trounced favorite Heartbreaking Dawns’ 1498 Trinidad Scorpion Sauce in last week’s round one bout. Jungle Heat was simply able to muster enough votes online to put it well over the top against HBD. 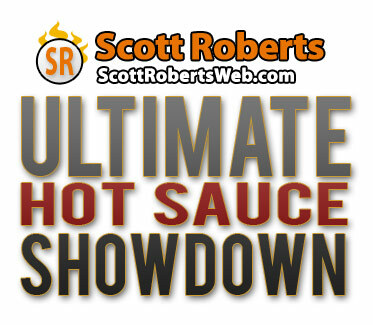 The next Round One battle will feature two sauces that I personally love. 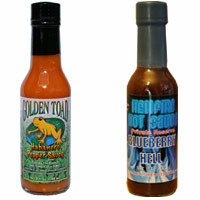 Golden Toad Habanero is a breathtaking sauce that’s almost like a “habanero in a bottle” (with a hint of garlic thrown in), while Hellfire Blueberry Hell is a wonderfully stinging and zesty product with incredible fruit undertones in it. As always, the decision is YOURS, fiery foods fans! Vote NOW!